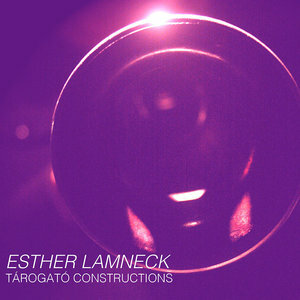 Woodwind virtuoso Esther Lamneck interacts with live electronics on her latest from Innova, Tárogató Constructions. The tárogató is a fascinating instrument, born of folk origins yet by no means an obsolete musical tool. Traditional in Hungarian and Romanian culture, its sound melds qualities from the oboe, clarinet, and soprano saxophone. Technically limited when compared to more common woodwind instruments, its construction allows for glissandi, timbral modifications, and a handful of other musical considerations considered impossible by more modern devices. In the hands of traditional folk musicians its a perfectly serviceable, charming instrument; in the hands of Esther Lamneck, however, it's an entirely different creation. An astounding virtuoso hailed by critics and publications around the world, Lamneck is an advocate for new music and multi-media performances. Director of Woodwind studies at NYU, her advocacy for contemporary music in recent years produced a wealth of electroacoustic collaborations, much of them represented on Tárogató Constructions. The album is a collection of interactions between the tárogató and live electronics, essentially pairing Lamneck with a series of digital duo partners, a project that fuses composition, programming, and improvisation. The three interactions between Lamneck and University of Buffalo professor Cort Lippe take cues from classic formal structures. With "Prelude" the electronic programming tracks the parameters of Lamneck's live performance, considering elements such as timbre, pitch, amplitude, and density. As Lamneck invokes haunting lines and gestures, the electronics react with glitches and textures that sound eerily organic. "Duo" features a twisting woodwind melody paired against unmistakably synthetic glitches and howls, directly contrasting the folk and contemporary aesthetics on the record. "Concerto" is beautifully unsettling with its fusion of later day John Coltrane-inspired eruptions supported by etherial pings and groans. Mara Helmuth's "Irresistible Flux" realizes the tárogató's folk origins with rich, sorrowful melodies brimming with pathos. Helmuth's programming (utilizing MaxMSP) is a rich tapestry of resonance, reverb, and manipulation all reacting in response to Lamneck's inspired performance. The work ebbs and flows between exotic beauty and ominous drones, finding a familiar spot between accessible warmth and abstract dissonance. Despite being completely dependent upon Lamneck's performance, the electronic elements never sound stale or predictable. Helmuth's programming is rich and nuanced, an oddly talented and beautiful soul in a machine. Paola Lopreiato's "Con forze che si svolgono sferiche" applies much of the same electronic manipulation and interaction as the rest of the record, yet the work comes across more like an art installation than a strict composition. Influenced by "the awareness of the importance of a soul launched in the adventure of life", the Lopreiato's contribution seems to have more distinct structure than the other works, relying less on improvisation and more on linear direction. The music seems to have a specific point to make, conveyed through immediately distinct sections, which make it a nuanced distinction among the rest the album. Sergio Kafejian's contribution "Construção" further explores the idea of improvisation as a means to composition through both a musician's perceptual process and a computer's system programming. Lamneck's glitchy scale runs and soaring melodies meld force inspire her digital duo partner to explore screeching soundscapes and ghostly incantations, executed with fantastic stereo effects. It's a fine work on its own, yet in the context of an entire album of electroacoustic works of the same ilk, sadly not as effective as it would sound on its own. Alfonso Belfiore's "Quanti di luce e suono" suffers the same fate, a fine work amidst an overabundance of talented musical twins. Mexican-born composer Jorge Sosa's "Enchantment", thankfully, is a standout with Sosa himself interacting with Lamneck in real time, the closest we have to a flesh-and-blood duet on the record. The repetition of aesthetic stands to be the only criticism of the recording as a whole. The logic and execution of each track is a fascinating exploration of folk instrumentation and digital manipulation, in particular when considering the specific, nuanced ways each composer chose to shape their programming. To the electroacoustic connoisseur Tárogató Constructions is a richly rewarding record, but for some listeners, the record may run the risk of repetition, regardless of its innovative spirit. Regardless, it's a distinct and striking contribution to Innova's roster, continuing their remarkable streak of new music releases.